When political leadership over the population issue falters, a sociobiological virus from a darker era begins to fester in our largest cities, argues Malcolm King. Alarmists blame everything on population growth, from traffic congestion to crime. For short-term political gain in the lead-up to the likely May federal election, the Morrison Government is consider reducing Australia’s permanent migrant intake cap from 190,000 to 160,000. Yet there is more to the population picture than numbers. The issue, at least as its framed by some contributors to public debate, contains multiple strains of our racist past, strident nationalism and eugenics. The global depopulation movement has many players in Australia who campaign against immigration on environmental grounds. In an astonishing piece of instrumentalism, elements of the movement have calculated how much food and energy Australians – the young, old and migrants – use in a year, thereby quantifying human value in terms of consumption. Just as eugenics – the parent philosophy of the depopulation movement – sought to provide genetic solutions through sterilisation of the mentally ill in the 1920s, so demography offers a cack-handed vocabulary and rationale for cutting immigration today. The depopulation lobby worship Thomas Malthus, who in 1798, wrote an ‘Essay on the Principle of Population’. Humans are depicted as consumers rather than producers. People are seen as problem-creators rather than problem-solvers. Innovation is considered a transitory palliative to the iron law of diminishing returns. According to Malthus and the depopulation lobby, the fewer of us, the better. Yet the rate of global population growth peaked at 2 per cent annually in the 1960s, and has fallen consistently since then (see graph below). Population growth has been in Africa, Asia and South America, driven by the introduction of basic health measures and western medicines. Birth rates in many European and East Asian nations are below replacement levels. China’s population will peak in nine years and then trend downwards. By 2100, global population will fall and, if the projections are correct, it may fall precipitously. The core feature of Australia’s population is dynamic complexity. Temporary migrants stay for a year and then move on. People move interstate and then move again. More than 15,000 Australians leave our shores every year to live overseas for more than 12 months. Kiwis used to flood in to Sydney but now more New Zealanders are returning home than arriving. According the Department of Home Affairs, Australia’s permanent migration ceiling in 2018/19 will be 186,515. Although due to falling skilled and sponsored visa applications, the number of permanent migrant numbers will struggle to hit 170,000. About 50 per cent of those will be employer sponsored or skilled migrants. Another 57,400 migrants will arrive under the family entry stream. Approximately 150,000 Australians are born every year from natural increase (births minus deaths). More than nine million international tourists visit Australia every year and about 300,000 international students arrive every year. Note the significant number of tourists and international students. While population growth adds roughly one per cent to Australia’s GDP (births and immigration), tourism adds almost 3 per cent of GDP ($42 billion) and international students add about 2 per cent of GDP ($28 billion). International tourism and international student numbers have been booming since 2012. If you want to know why parts of Melbourne and Sydney are congested, look no further than tourists and overseas students. They flock in and out of our two largest cities because these metropolises have a social, cultural and economic gravity all of their own. The prime aim of the depopulation lobby is to slash international student and tourist numbers because they are large consumers of goods and services. I’ve heard many arguments against capitalism but this is the most bizarre. It’s a direct attack on the middle class and kids wanting to better themselves by studying overseas. In South Australia, I was born …. There is no more compelling evidence of the nation’s two-speed economy than population growth and movement in South Australia. About 9000 overseas migrants arrive in SA every year but this figure is falling. Two out of three migrants leave within two years. Fewer migrants will hitch their future to a state with high unreported unemployment and underemployment. Roughly 5000 South Australians leave every year (arrivals minus departures). I suggest this figure is understated as leavers must notify Medicare of a change of address before they are counted. 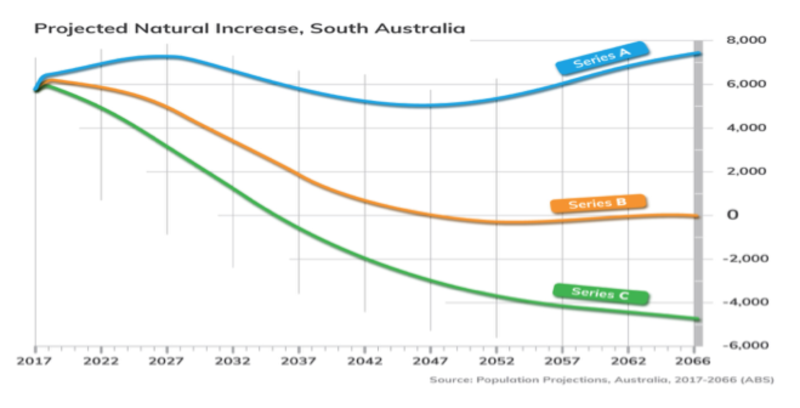 The graph below plots projected births in South Australia. Series A projects a natural increase of 7300 in 2066, due mainly to higher assumed fertility rates and an increase in births from overseas arrivals. In series B, deaths increase at a greater rate than births up until 2053, after which natural increase remains around zero. In series C, the number of births decline due to the low fertility rate and low levels of migration. Currently, this is SA’s future. Flat or negative population growth and the retirement and death of the Baby Boomer generation, means a contracting “taxable horizon”. That means higher taxes or fewer services. But it’s not all doom and gloom. The Tonsley Manufacturing Innovation Hub, for example, is looking at strategies to create processes and products up the value chain. That’s where real economic transformation will come from. Migrants with skills in that area would be most welcome. The population issue is complex and susceptible to fear campaigns. Most of us know that the roads are congested because we all set off to work and leave work in peak hour. In the main, we are sole drivers, sitting in depreciating assets as they guzzle petrol. It’s not people that are unsustainable. It’s our behaviour.